This ride is part of our efforts to improve biking in southwest Iowa. Learn more about this project here. Join Harrison County Conservation, Woodbine Main Street, and Golden Hills RC&D on Saturday, May 4 to celebrate the launch of Harrison County's first designated on-road bicycle route! 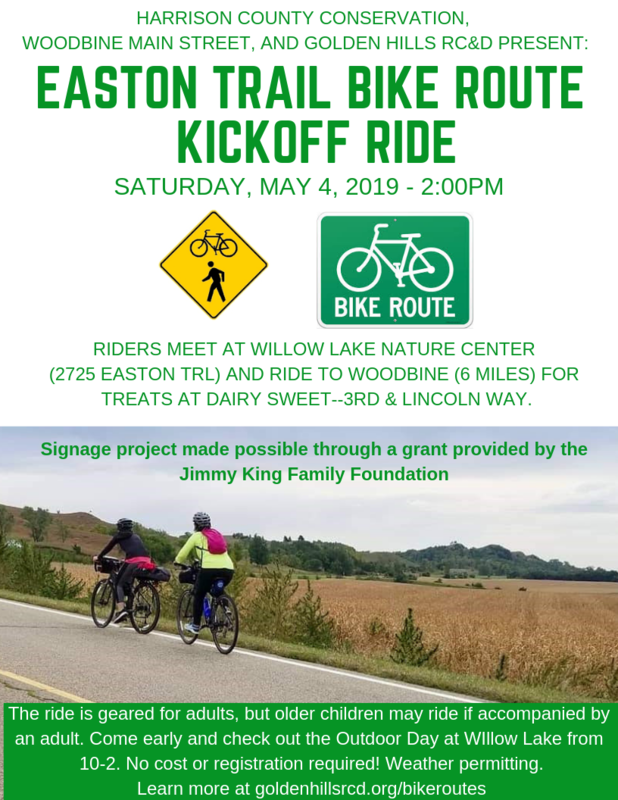 Bring your bike and between two of Harrison County's best amenities: Willow Lake Recreation Area and Woodbine's historic Main Street district. You can then ride back to Willow Lake or have someone pick you up in town if you don't want to ride roundtrip. The ride is targeted to adults as it is along a county highway and may be unsafe for younger children. Riders will receive a coupon for a FREE Large Cone or FREE Medium Shake or Malt at Dairy Sweet in Woodbine. Signage for the bike route will be installed this spring, encouraging drivers to be safe and watch for bicycles on the road. If you don't want to ride the route, you can still bring your bike and ride around the park. Riders are encouraged to come earlier and enjoy Willow Lake Outdoor Day from 10-2. Food and drinks will be available for participants. We will have information about safe biking for all ages and how drivers can safely share the road. A bike mechanic will be on hand to help with basic repair and maintenance, so dust off the ol' Huffy and join us at Willow Lake! Ride will be held weather permitting. Click here for a one-way route map (from Willow Lake too Woodbine) or click here for a roundtrip map (Willow Lake to Woodbine and back to Willow Lake).